Four months of the minor league season are in the books as July comes to an end. The Twins organization has seen an influx of talent over the last four or five days, as you know. But there are some Twins hitting prospects who have had incredible months in July. In fact, you could legitimately make the case that six or seven guys hit well enough in July that they would win this award many other months. That is great to see in the Twins pipeline. Let’s take a look at the Top 5 hitters for the month of June, but first here are some players deserving of honorable mention. Akil Baddoo - Cedar Rapids Kernels - 30-107, .280/.363/.439 (.802) with eight doubles, three triples and a homer. Taylor Grzelakowski - Ft. Myers Miracle - 31-88, .352/.396/.511 (.907) with ten doubles, and two triples. Mitchell Kranson - Chattanooga Lookouts - 23-72, .319/.398/.486 (.884) with four doubles, a triple and two home runs. Royce Lewis - Cedar Rapids Kernels/Ft. Myers Miracle - 33-112, .295/.370/.420 (.790) with eight doubles and two homers. Jose Miranda - Cedar Rapids Kernels - 39-114, .342/.382/.553 (.935) with six doubles and six home runs. Number 5 – Chattanooga Lookouts - Zander Wiel - .336/.424/.551 (.975), 36-107 with seven doubles, two triples, four home runs and 14 RBI. Many months, Wiel’s July numbers would be a serious contender for the monthly honor. For him to be fifth on this list tells you a little bit about the numbers the guys ahead of him put up. Wiel has had a really solid season. He’s shown more consistency than he has in the past. During this month, he hit for a high average. He got on base. He showed power. He’s seemingly made himself an even better athlete since the draft with enough speed to beat out some triples. Over the last couple of months, Wiel has been hitting in the leadoff spot for the Lookouts with Brent Rooker hitting second. The combination has often given their team a first-inning lead. They also have split time between left field and first base, as well as getting some DH days. While he strikes out at times, he has also really improved his eye and had 16 walks during the month of July. Number 4 – Elizabethton Twins - Chris Williams - .277/.391/.585 (.976). 26-94 with two doubles, nine home runs and 26 RBI. Again, Chris Williams had a July worthy of the top spot, but he’s #4 on our list this month. Williams was the Twins eighth-round pick this June out of Clemson where he spent three years. Drafted as a catcher, he has played first base most every game for the Elizabethton Twins, and he’s been a force in the middle of their lineup. He has had a lot of interesting games. He’s had a two-homer game. He also had a game in which he walked five times. He has walked nearly as much as he struck out. You can get to know more about Chris Williams in this recent Q&A at Twins Daily. Number 3 - Chattanooga Lookouts – OF/1B Brent Rooker - .315/.406/.604 (1.010), 35-111 with 11 doubles, seven homers and 22 RBI. Rooker was the runner-up last month for Hitter of the Month when he posted an OPS over 1.000, and he did it again in July. Since starting the season very slowly, Rooker has dominated the Southern League the last two-and-a-half months. His strikeout rate has dropped. His walk rate has greatly increased. That combination means that when he’s swinging at good pitches, he is hitting the ball really hard. Still hard to believe that he’s doing this just 13 months after being drafted with the 35th overall pick out of Mississippi State. This month, he hit for average, got on base a lot and continued to hit for power. He has been the Twins minor league hitter of the week three times this season already. Sure, he’s still got room for improvement. The strikeouts are still too high, but Rooker is putting together the kind of numbers that indicate that he could be ready sooner rather than later. Number 2 - Ft. Myers Miracle – OF Alex Kirilloff - .396/.422/.614 (1.036), 40-101 with 12 doubles, two triples, two homers and 20 RBI. To repeat the initial comment from each of the first three mentioned above, most months, with these numbers, Alex Kirilloff would be the minor league hitter of the month. Instead, he’ll have to settle for the #2 spot. That’s OK. I mean, he was the Twins Daily minor league Hitter of the Month in May. His 13-game hitting streak came to an end on Tuesday night with an 0-for-2 night, but during that stretch, he had eight multi-hit games, and that doesn’t even count the 2-for-2 game he had at the Futures Game in that stretch. He’s become an extra-base hit machine. The 2016 first-round draft pick moved up to Ft. Myers in mid-June. After missing all of 2017 (Tommy John surgery), it didn’t take him long to adjust to the Midwest League. Likewise, it didn’t take him long to adjust to the Florida State League. In fact, he’s hitting .376 with the Miracle. In 100 combined games between Cedar Rapids and Ft. Myers, he has hit .349 with 34 doubles, seven triples and 16 home runs. Elizabethton Twins – C/DH Ryan Jeffers - .384/.517/.648 (1.165), 35-91 with nine doubles, four homers and 16 RBI. The Twins used their second-round draft pick on UNC-Wilmington catcher Ryan Jeffers. He signed quickly, and for under slot value, and was assigned to Elizabethton where he immediately started to rake. He had two hits in each of his first two games. Then he had three hits in his third game and four hits in his fourth game. In July he was tremendous. As you can see from the numbers. He hit for average. He took a ton of walks and got on base over half of the time. In fact, he had 21 walks to go with just 17 strikeouts during July. And, he provided a lot of power. He moved up to Cedar Rapids late in July. He went 2-for-19 in his first five games with the Kernels. However, in the final two games of the month, he went 4-for-4 with a walk,three doubles and a homer, and then 3-for-5 with another double and another home run. While he’s known more for his bat, Jeffers also was behind the plate for Jhoan Duran’s Kernels debut on Monday night in which he threw seven, no-hit innings. He’s got work to do behind the plate, but his bat will play. As you have read, there were a lot of strong candidates for July hitter of the month, probably even a few behind the Top 5 who might win this award with their numbers in many months. 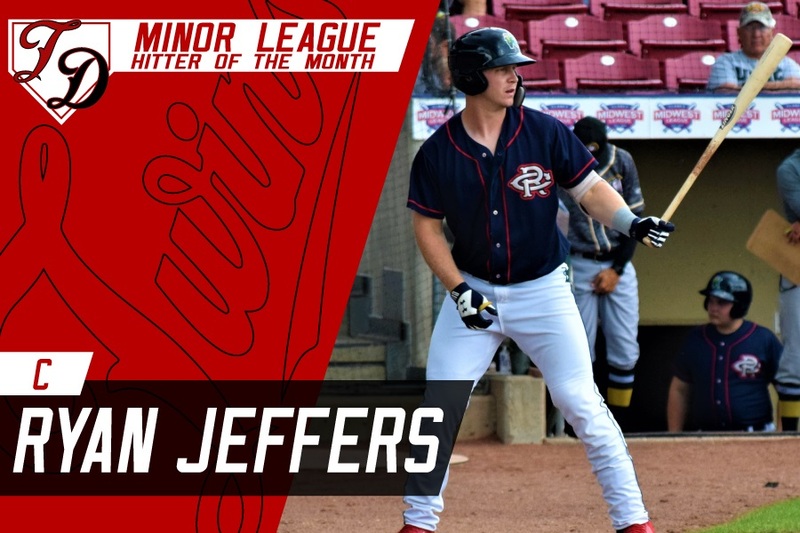 But Ryan Jeffers ended his month very strong after his promotion to the Midwest League and earned this month’s Hitter of the Month award. We would like to congratulate Ryan Jeffers, Twins Daily’s choice for Minor League Hitter of the Month for July 2018. Feel free to share your thoughts and ask questions. The curious case of Alex Kirloff,I love the twins and followed the system when it was the sunday paper and sunday propect report on 830. Kirloff is without a doubt the hitter of the month. He is also the #1 prospect in our system, and its not close.He is not dominating, he is destroying!! Who is the next Trout. Unless he fields like Groseman. Imo put Tony O in the hall!! Kirilloff gets my vote. Does rookie league even count? Only three of the 10 are as high as AA ball, and 2(1/2) in high A. It will be exciting when they are all in AAA (where the hitting is dismal) or AA, and close to where it really matters. Looking at what Miranda and Gryz did and they weren't in the Top 5?What a month. It took Jeffers what, five games to adjust to the Midwest League.Will he rise fast thru the organization, Seth?Or will his defense slow his progress a bit? Kiriloff goes to high A and didn't skip a beat, not even a hiccup. I like Jeffers a lot but still have to go Kirioff. Great report as always Seth. Bottom line; we got some big time guys that can really mash. First, Kirilloff is a phenom and is going to be special.He could honestly win Hitter of the Month every month. Following the minors has always been my favorite, but this past month was ridiculous.So many solid bats swinging.Your list hits it on the head.So many capable bats.Even Baddoo has been doing more than walking it out.Miranda keeps excelling, and Rooker has been pretty lights out.Now Falvine has added more bats to the system.Should have an award for Breakout New Minor Leaguer (Austin popped a bomb last night, De La Trinidad has been fantastic, and Jhoan...wow, what a debut).Our top prospects have moved from pitcher heavy to bat heavy (not sure how great that is).Lewis and Kirilloff are flat out two extremely great kids that can play the game and go about it the right way.In Jeffers, we've seemed to find a catcher who can smash balls.And I'm LOVING EVERY MINUTE OF IT JERRY!! !Rortvedt's bat is coming around, which is great.But man, Jeffers can swing. Talent is rolling right now. I hated the Jeffers pick in the draft so I have egg on my face now.I am amazed at what he is doing with the bat. With his eye at the plate, ability to square up the ball, and starting to hit for power he should be a fast mover.Very impressed with what he has done so far.Real test is High A for most batters as off-speed pitches get better so will have to wait and see but I think he will be a difference maker. Always loved the Kiriloff pick and was surprised he fell to us in the draft.Just amazing with the bat.He should be in AA as High is just too easy for him. So fun to see so many guys performing well.The future looks bright. These bats are getting exciting. More hard hitting corner guys than you could shake a stick at. Hopefully they all finish the season strong so as their value is elevated if the Twins happen to be looking to make some trades this off season. I could have written up Gelly and Miranda too ,but then I could have added another player or two, so I left it at five. As for Jeffers. I think he'll move fairly quickly. Some will depend on his defense too because they'll want him to catch, not be a DH. Yesterday on the radio, Falvey said they will be using our prospects to make trades. That was part of their thinking, when they made a deep, top 10 farm system deeper. With seemingly half the teams in baseball doing some form of rebuilding, I'm guessing they will package 2 or 3 of our prospects, and make that blockbuster trade, we've been all waiting for this off-season. I hope not.Houston put the team on the MLB field before doing trading.They let the cream of the system rise and get in place, then filled in. Since we have an under-performing and decimated MLB, these players are where the real baseball fan has turned and it is tough to watch them get handed out like popcorn to bring in rentals and old guys. Very interesting.I also heard something last night when he was asked about August waiver trades.Sounded like he was both positive about doing one and that it may not be the norm, ie, we get someone like Santana thru waivers and trade him for cash and that PTBNL. After reading your comment, got thinking that maybe they trade someone like Santana together with a good prospect for a very good prospect closer to being ready, maybe AA.Prospect leaving could be one of ours or one of those we just acquired.We have upgraded both the quantity and quality of the organization.Maybe they will focus on upgrading more quality this month. Rortvedt's bat is coming around, which is great.But man, Jeffers can swing. Agreed.We're not going to see Rortvedt on these lists much.And he doesn't get talked about a ton as we all assume he's still years away. But, he's having the type of year you would want a 20-year-old defense-first catcher to be having.OPS over 700 at CR, and since the promotion to Ft Myers, the OBP is actually up and K% down in early results. We can only hope that's the case. If they want a quick bounce back to contention it needs to happen. Everyone loves their new shiny toys but they can certainly afford to lose a couple of prospects now. I am irrationally excited about Kiriloff.....and want Rooker in AAA right now. 2.) to use in trades to acquire players for the MLB team. Kirilloff reminds me a lot of John Olerud,Just a natural hitter that barrels up everything. Yes, I think Rortvedt will be find with the bat...he's still young. But I can't help think what it would be like to combine Rortvedt's defensive savvy with Jeffers' offensive prowess. An honorable mention to DSL-Twin Victor Heredia. In July, he collected 33 hits in 77 at-bats, a line of .429/.451/.753, with an OPS of 1.204,8 doubles, a triple, 4 homers, 19 RBI's and 18 runs. He turned 18 in June. I know the DSL is a long way from the majors, but several players got their professional start with the D-Twins most notably Brusdar Graterol, Wander Javier, Lewin Diaz, Fernando Romero. Felix Jorge. Miguel Sano and Jorge Polanco. When can Kiriloff's time be now? I looked back the other day, and it seems like most every Twins DSL season has included a player or two that went on to become legit prospects (if not Major Leaguers). Having said that, you can't read into the stats too much. ... without the metal plate in his head, of course!